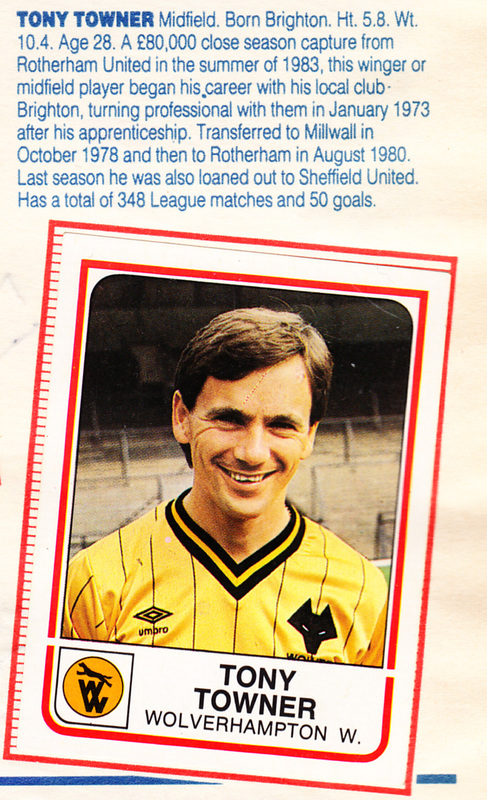 I wish Peter Ward had signed for us earlier. I saw Ward slotting straight into Woodcock’s position, with Trevor Francis striking from midfield; everything about the deal looked right, yet everything went wrong. There was no answer to that, so I went to Burton and watched them in the second leg of the FA Trophy semi-final against Buxton, whose centre-half was Peter Swan, the old England player. Swan gave Ward a hard time and Burton lost, but I still thought, ‘Yes, he’ll do.’ Burton played at Maidstone four days later and I took Brian Daykin with me. He’d seen Ward once and voted no; I’d seen him once and voted yes, so it seemed a good idea to watch him together. The pitch was bad; Burton, who had turned up with a scratch side, were bad; and Ward was bad – yet he still showed a few class touches, enough to make him worth a £4,000 gamble. Ward has scored a hat-trick for England Under-21s and had a place in the full England squad but I don’t think he’ll realise his full potential because of inconsistency. Yet I like him. He is very good with his back to goal because he can turn and lick defenders and finish. That’s a rare quality – sticking it in the net. Brighton’s Second Division stock may have been devalued by their loss-making start to the season but for manager Barry Lloyd there is one glimmer of future prosperity amid the gloom. That’s the form of Robert Codner, the city whizz-kid with talent in his boots and balance sheets in his briefcase. Lloyd paid GM Vauxhall Conference club Barnet £115,000 for Codner in September, fighting off the First Division money men of Tottenham, Millwall and Wimbledon, and Second Division Leicester City, just days after he paid the same sum for Barnet defender Nicky Bissett. “My work doesn’t affect my football. It probably helps as I am able to take my mind off the game if things go badly. If you are out of the side you can get depressed but I have another avenue into which I can channel my energy. Now I am a footballer people want to be associated with me and it is easier to get clients,” he says. Indeed he’s already taking advantage of his new-found fame, interesting SHOOT’s reporter in his services! 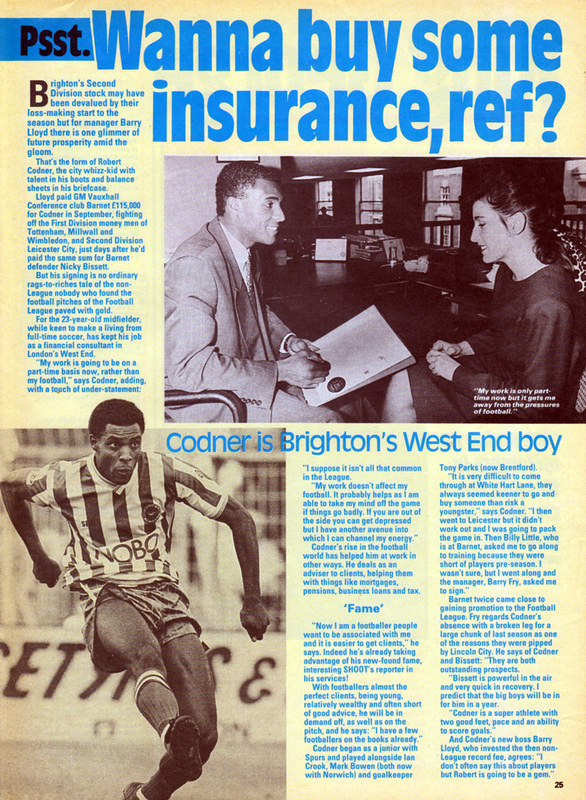 Unsurprisingly, having hung up his boots, Robert Codner is now a football agent. 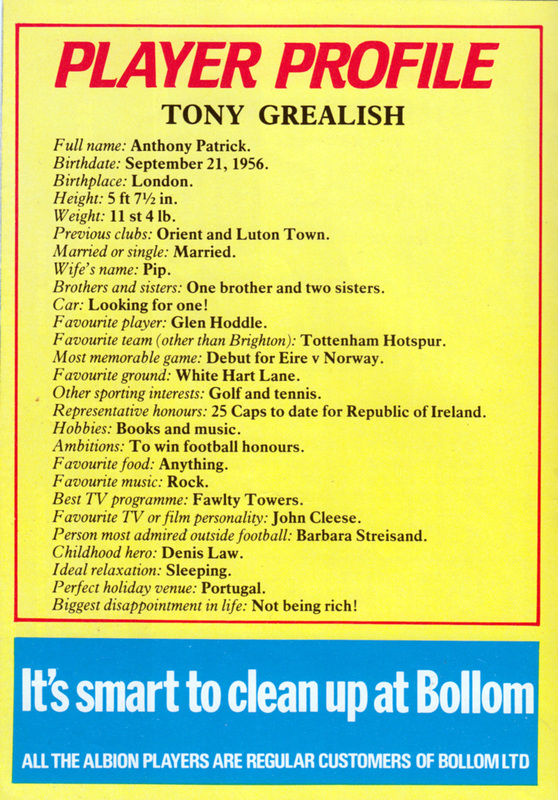 I wonder if he fulfilled his stated ambition when he was at the Goldstone Ground: his goal to be become a millionaire. This relatively unknown publication was billed as an annual, but I’m pretty sure that there was never a sequel. 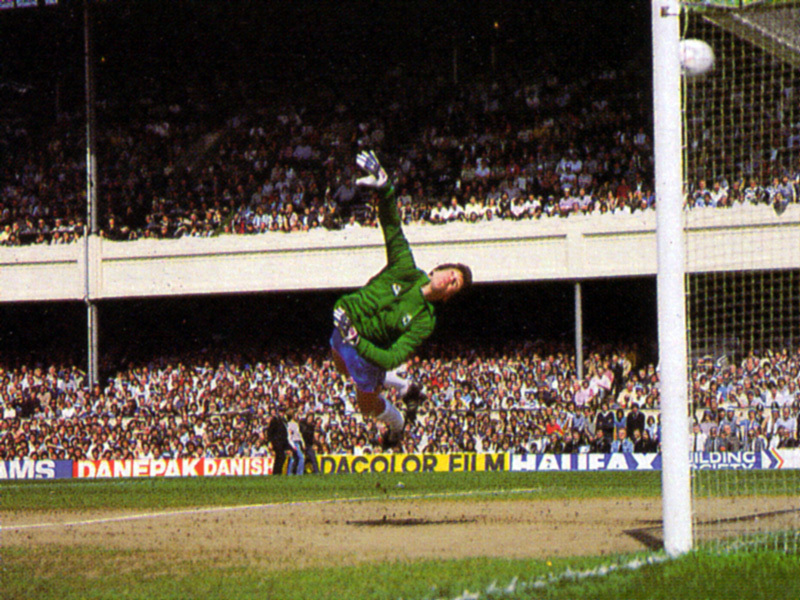 Peter Taylor had recently saved Derby from relegation into the Third Division as well as putting Clough’s Nottingham Forest out of the FA Cup. So it must have seemed a pertinent question at the time. 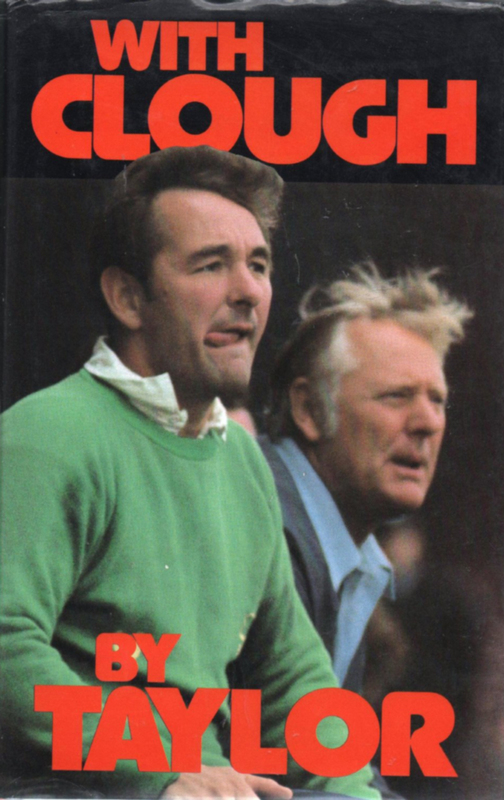 Even so, that article disappointingly overlooks Clough and Taylor’s spells down on the South Coast. 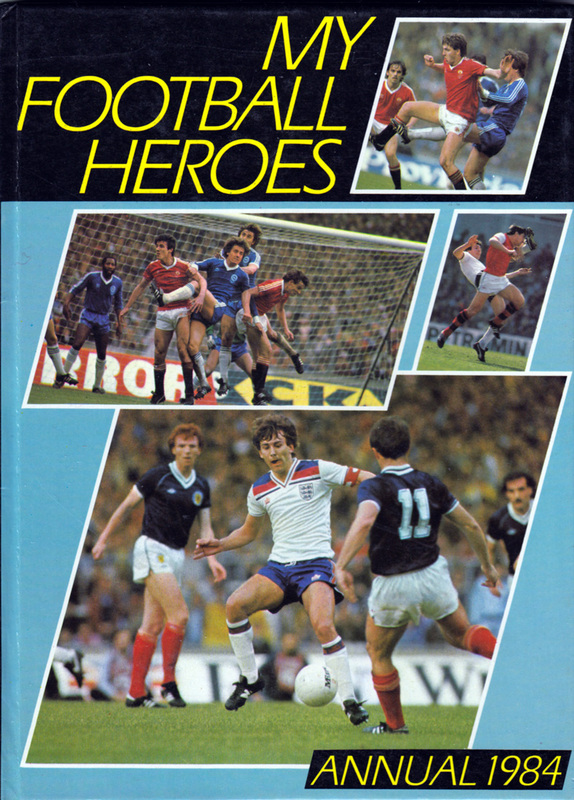 And, just like the other pieces in this annual, it also suffers from the drawback that ‘My Football Heroes’ didn’t have direct access to the players and managers, unlike the interviews that appeared in ‘Shoot!’ Annual. Nevertheless, this rather obscure publication does rather eulogise the Manchester United team and players of the time, with pieces on Alan Davies, Bryan Robson, Norman Whiteside and Ray Wilkins. 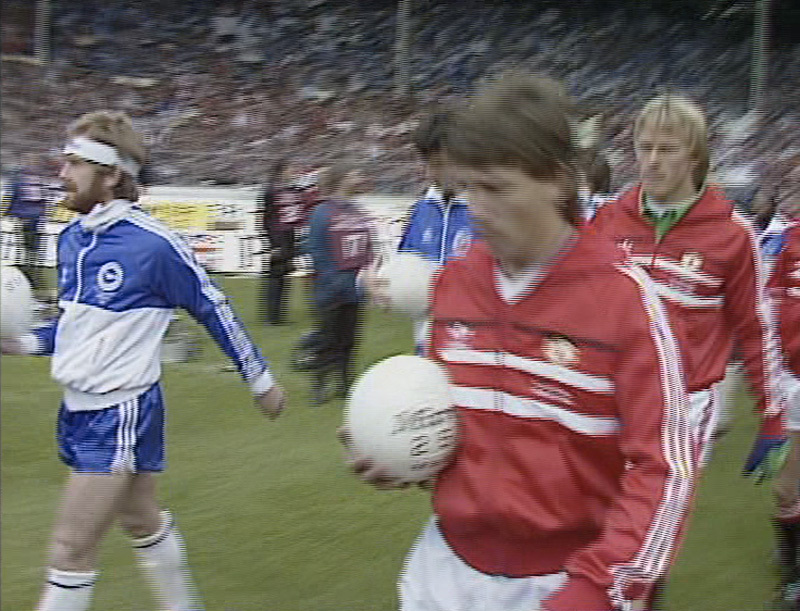 Through this, we get to enjoy some colour action shots from the 1983 FA Cup Final, ones that I have not seen any where else. 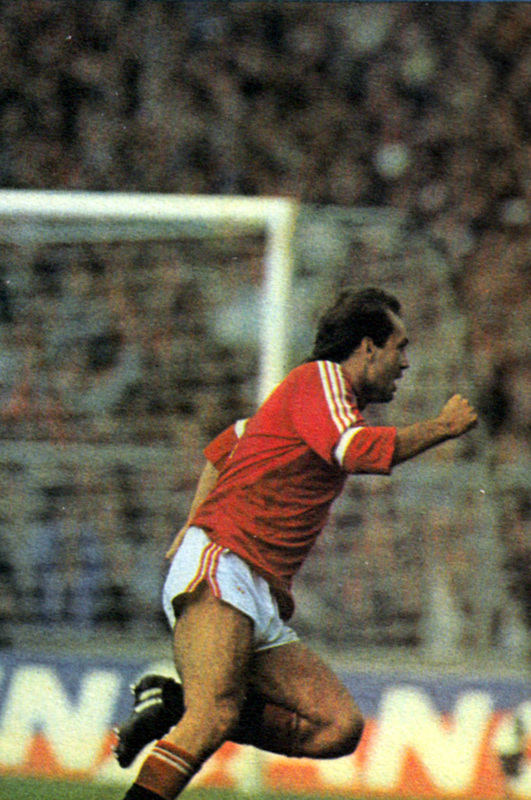 And finally, Ray Wilkins scores one of Wembley’s finest goals before wheeling away. 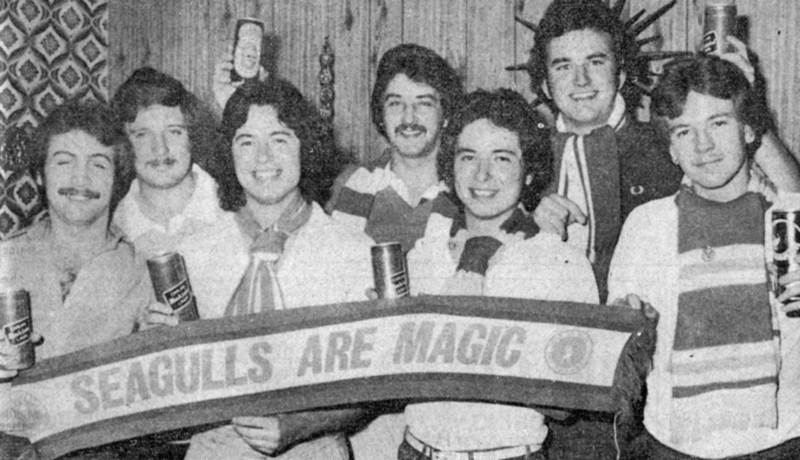 (left to right): Peter Warland, Derek Chapman, John Bayley, Jeff Walls, Kevin Bayley, who is twin brother of John, Lee Phillips and Stevie Smith. Albion are called the Seagulls because of Crystal Palace. The group who dubbed them the Seagulls begrudgingly give their arch-rivals a little credit. But we have traced the lads who thought up the name and, as the revelry over promotion continued, they explained how it all began. The cry Dolphins never roll easily off the frenzied lips of even the most ardent fan – even when your team was getting the better of Crystal Palace. The Albion have always tried to develop the seaside theme and in pre-war days were known as Shrimps. Many would suggest the nickname was rather appropriate: they were rather small fry and inclined to be gobbled up by the Football League’s big fish. 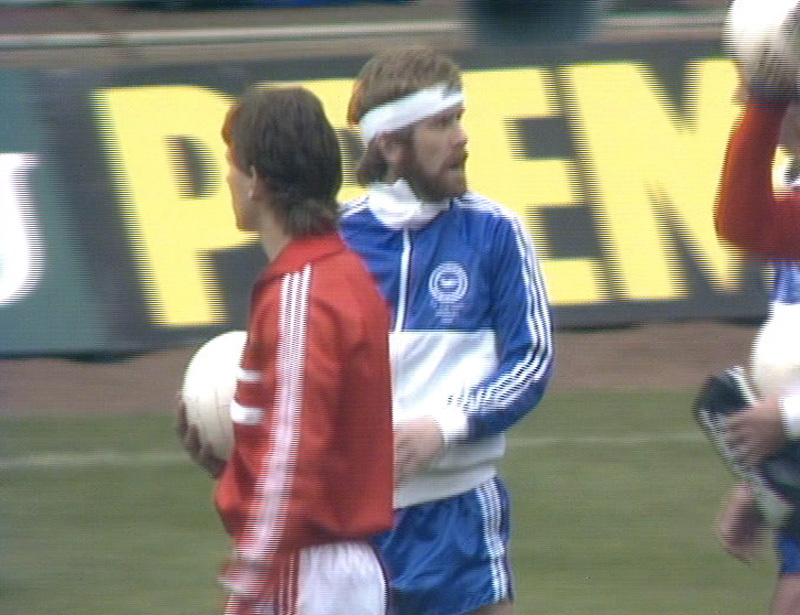 Added to that, Gillingham were also known as the Shrimps, which complicated things. The re-named Dolphins was intended to develop the local link as the Brighton town crest has them, but it never had popular appeal. Jeff Walls had the marine connection in mind at this Christmas booze up, when he queried: “What do you call those birds down the seafront?” His mate Lee Phillips chanted “Seagulls” and then the nickname was out. It soon spread around the pub, a favourite meeting place for fans. By February the terraces were picking it up and by the end of the season it caught on good and proper. The police had given a helping hand, as well. A crackdown on behaviour in the North Stand led to migration to other parts. Nowadays, Derek Chapman is a director at the club. Also, as mentioned before on this blog, despite what the article says, the club were never known as the Shrimps. 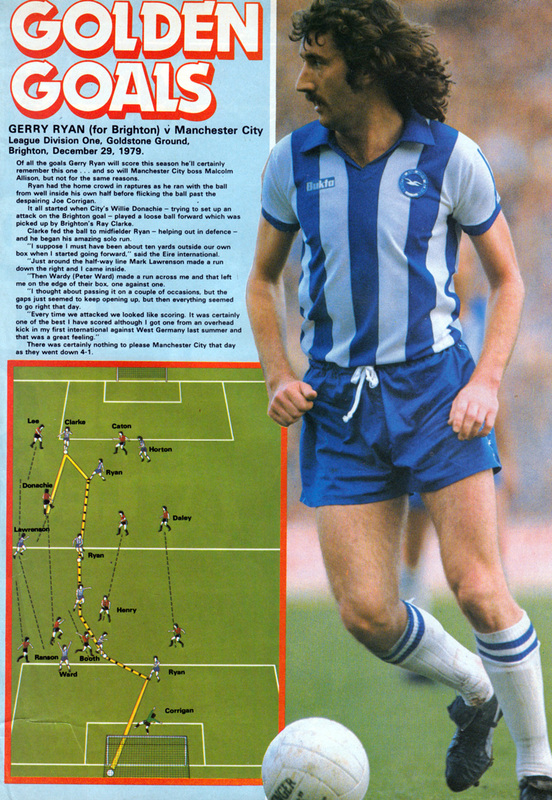 Beginning his dribble half-way in his own half, this wonderful solo goal by Gerry Ryan against Manchester City in December 1979 was given the Match Weekly magazine diagrammatical treatment. 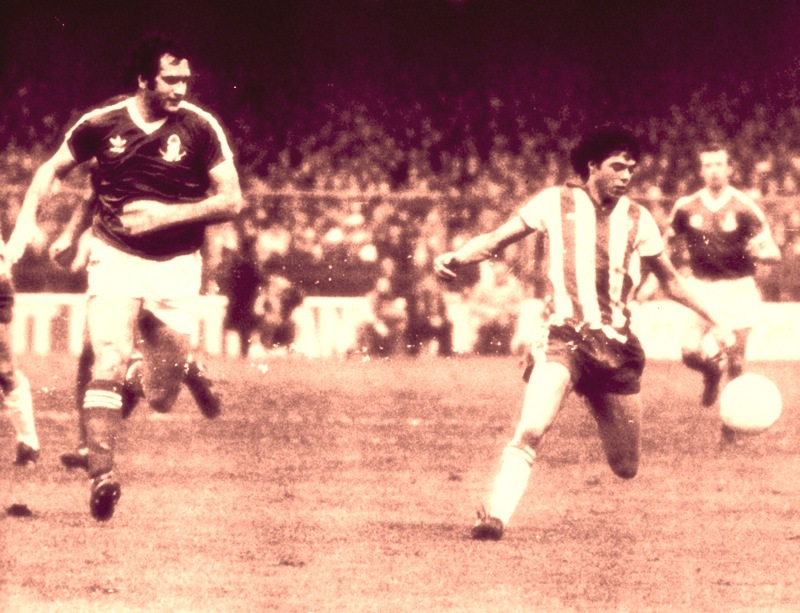 The game was a 4-1 triumph and Ryan’s solo effort was Brighton last ever goal of the 1970s. 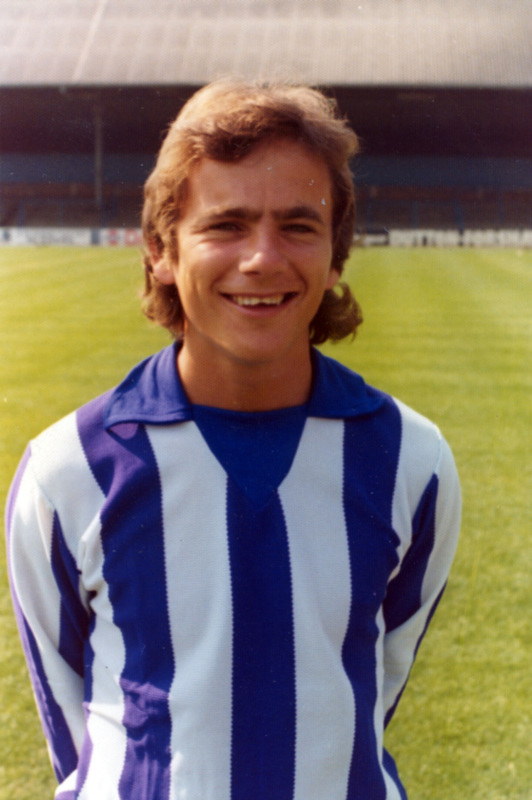 It’s very sad news to hear of a former Brighton & Hove Albion player who has died. 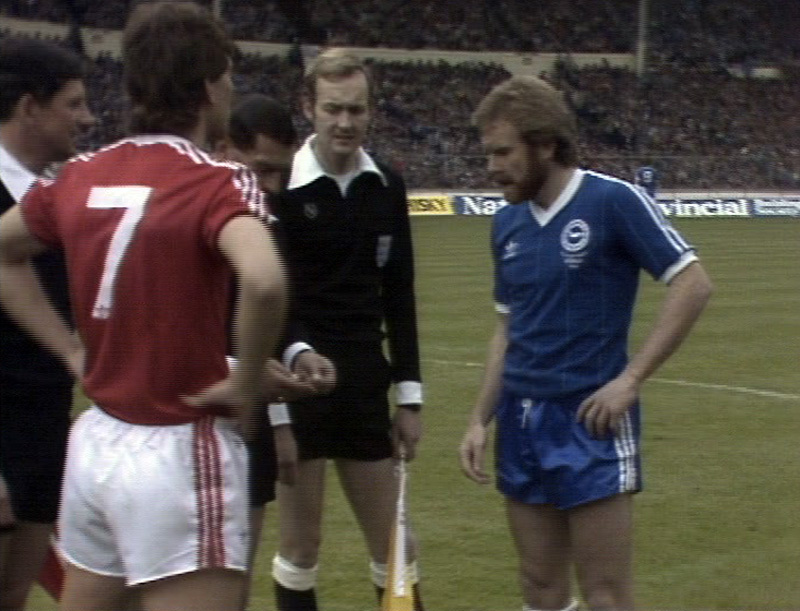 It’s particularly regretful that the first Albion player from the glory years of 1976 to 1983 to no longer be with us is the man who captained the side at its first ever FA Cup Final, in May 1983. 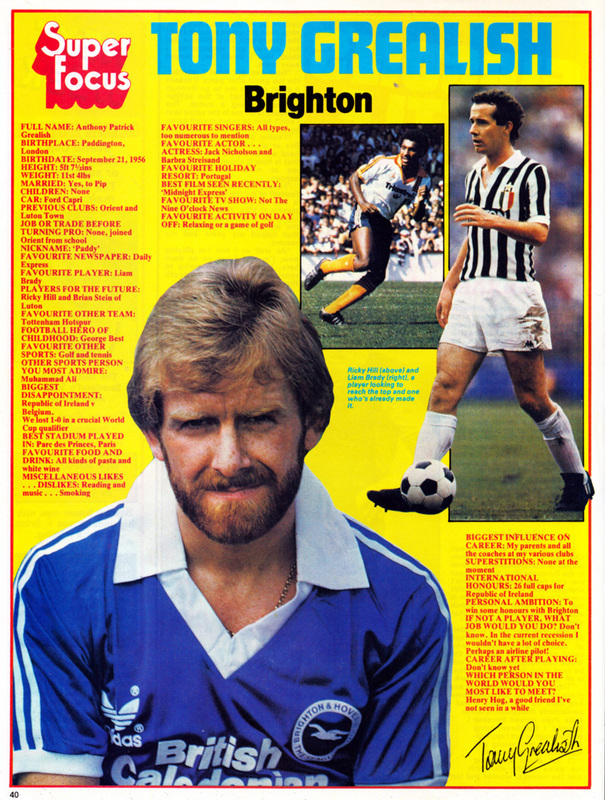 It’s fair to say that Tony Grealish was not so popular with fans when he was signed from Luton Town for more than £100,000 by new manager Mike Bailey in July 1981. 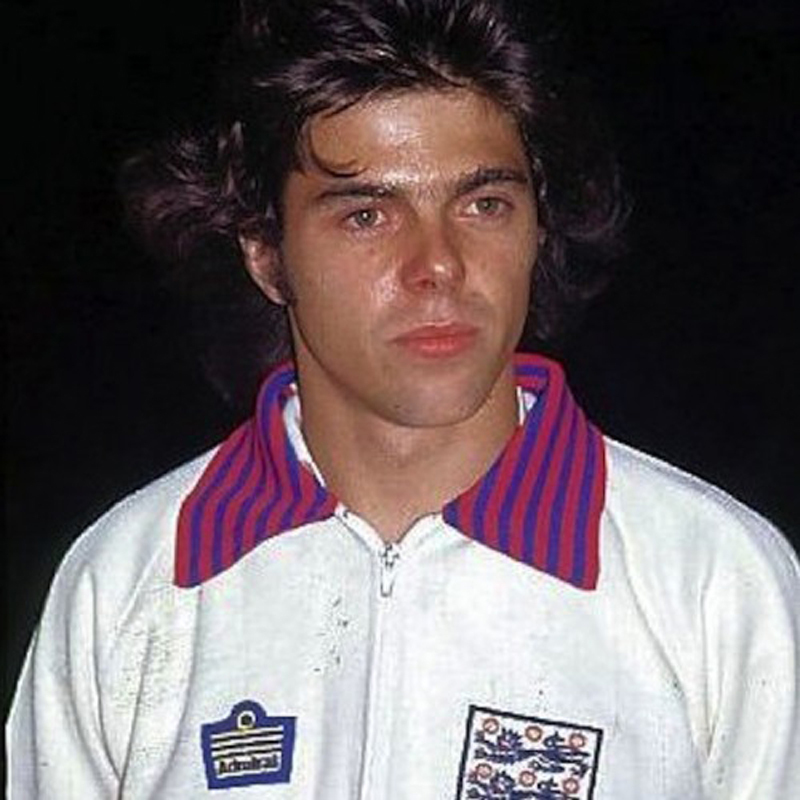 The tenacious midfielder was not in the best of form in his first season, and he had the difficult job of replacing ex-skipper and crowd favourite Brian Horton who found his way to Tony’s previous employers, Luton. He teed up Jimmy Case’s scorching goal in the FA Cup Semi-Final against Sheffield Wednesday with a cheeky backheeled free-kick (1 min). 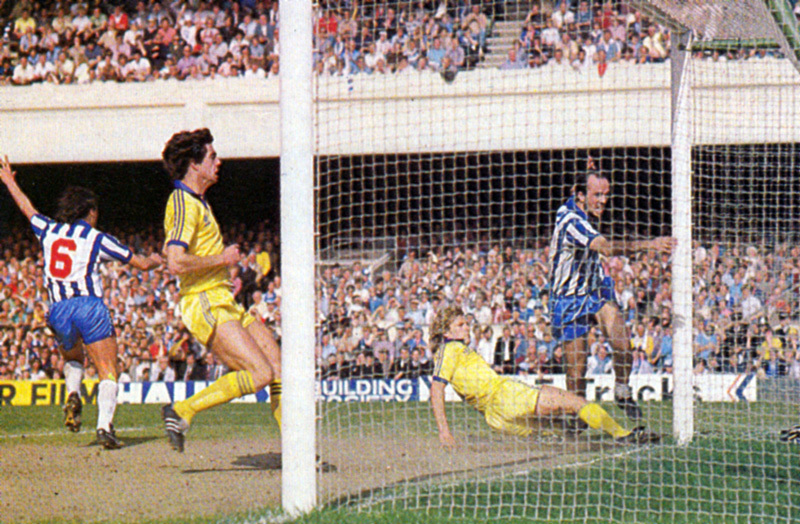 As well as a characteristically wholehearted performance, the Seagulls’ number four was involved in the build-up of both of Brighton’s goals in the FA Cup final against Manchester United, switching the ball out wide for Gary Howlett to cross for Gordon Smith’s opener and then pushing the ball into the path of Gary Stevens. In the following season, Tony Grealish (and Danny Wilson) ran the Liverpool midfield ragged in another famous FA Cup game. The industrious Republic of Ireland international eventually left in March 1984, signing for West Bromwich Albion in a £95,000 deal. 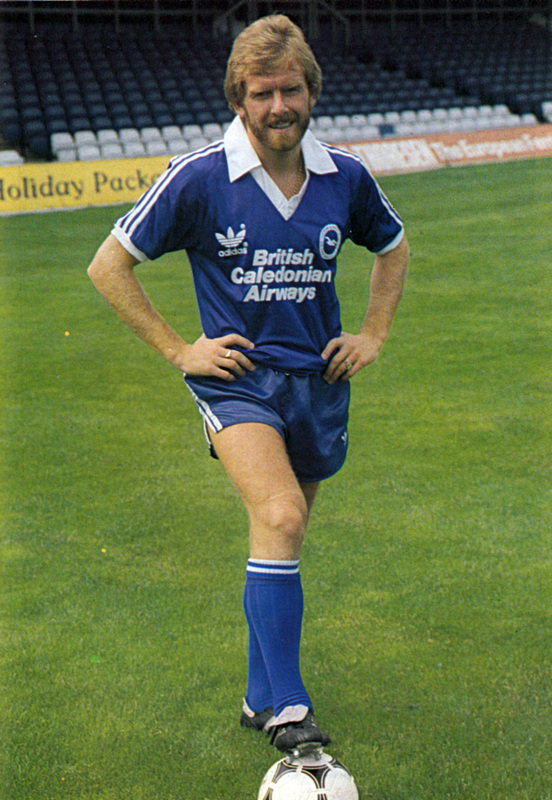 That’s rather fitting, and not just because of his British Caledonian shirt! In the words of a North Stand Chat user called ‘rool’, Grealish now joins Alan Davies in the 1983 FA Cup Final reunion in the sky. 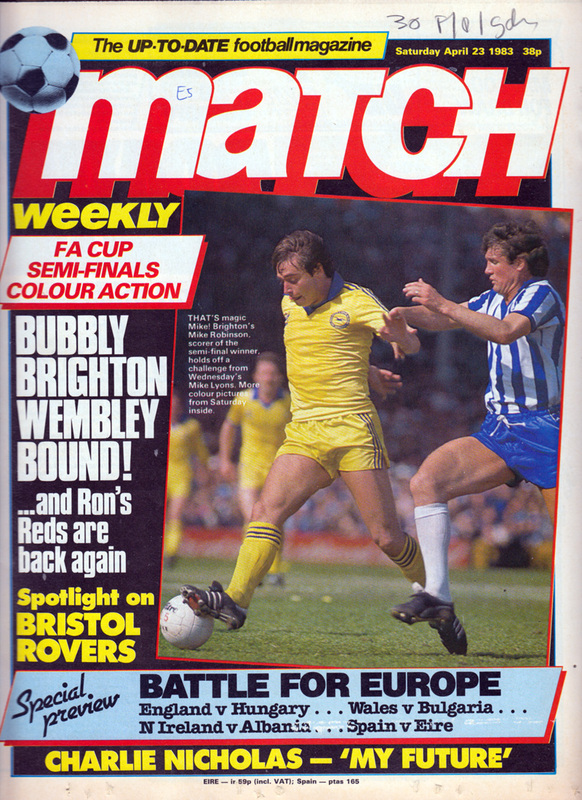 Marvellous colour images abound in Match Weekly, living up to its curious strap line ‘the up-to-date football magazine.’ Of particular interest here is the cover of the very popular Michael Robinson, scorer of the winner in the the FA Cup Semi-Final against Sheffield Wednesday in sunny Highbury. Inside there is this gorgeous centre-spread. Print it out and stick it on your bedroom wall for old time’s sake! Mike Bailey: Brighton for the title! It may seem fanciful to talk about the title in relation to a club that eventually finished in 13th position but the club seemed to be in good shape in 1981/82. 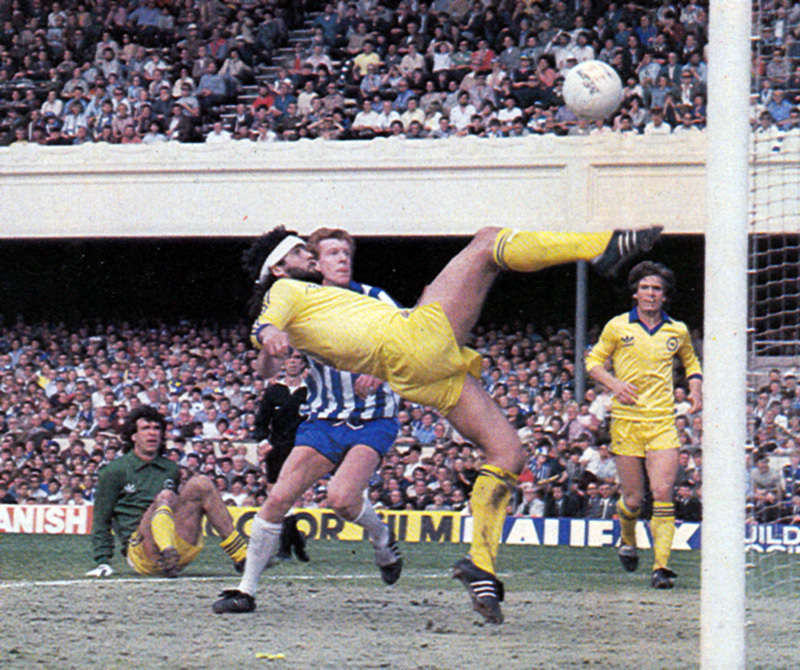 Brighton and Hove Albion were fifth in Division One in late September following Andy Ritchie’s winner at Wolves. It was the club’s highest ever league placing. In December, the Seagulls were still soaring high, getting to sixth spot after a 2-0 win against Southampton at The Dell. A place in Europe beckoned. “I am an ambitious man. I am not content with ensuring that Brighton survive another season at this level. I want people to be surprised when we lose and to omit us from their predictions of which clubs will have a bad season. I am an enthusiast about this game. I loved playing, loved the atmosphere of a dressing room, the team spirit, the sense of achievement. As a manager I have come to realise there are so many other factors involved. Once there on that pitch the players are out of my reach; I am left to gain satisfaction from seeing the things we have worked on together during the week become a reality during a match. I like everything to be neat – passing, ball-control, appearance, style. Only when we have become consistent in these areas will Brighton lose, once and for all, the tag of the gutsy little Third Division outfit from the South Coast that did so well to reach the First Division. We sold Mark Lawrenson, Brian Horton and John Gregory. I believe it was necessary because while I agree that a player of Lawrenson’s ability, for example, is an exceptional talent, it is not enough to have a handful of assets. We must have a strong First Division squad, one where very good players can come in when injuries deplete the side. In an unusual managerial swop of sorts, Bailey had been appointed at the Goldstone in June 1981 from Charlton Athletic, with ex-Brighton boss Alan Mullery eventually taking over the vacancy at Charlton. 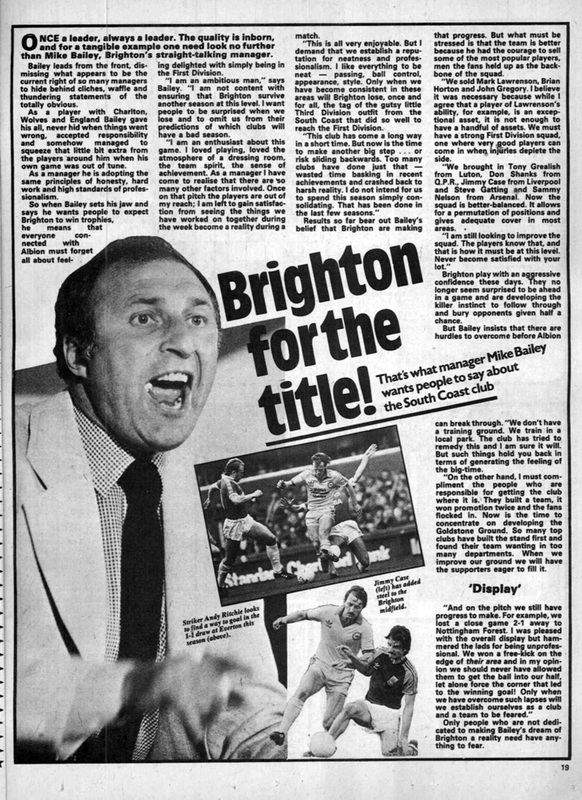 The new Albion boss certainly made Brighton a hard team to beat by mid-November 1981, with only two League defeats by then. A surprise 1-0 victory was even recorded against Tottenham Hotspur at White Hart Lane in October, thanks to Michael Robinson’s goal. ‘Don’t concede away from home and try to nick a goal’, seemed to be the Bailey plan. The very cautious, defensive tactics he employed may have made the Albion a force to be reckoned with, but it bored many supporters who had been used to the free-flowing, attacking football played under his predecessor Alan Mullery. Only Liverpool attracted over 20,000 to the Goldstone before Christmas. 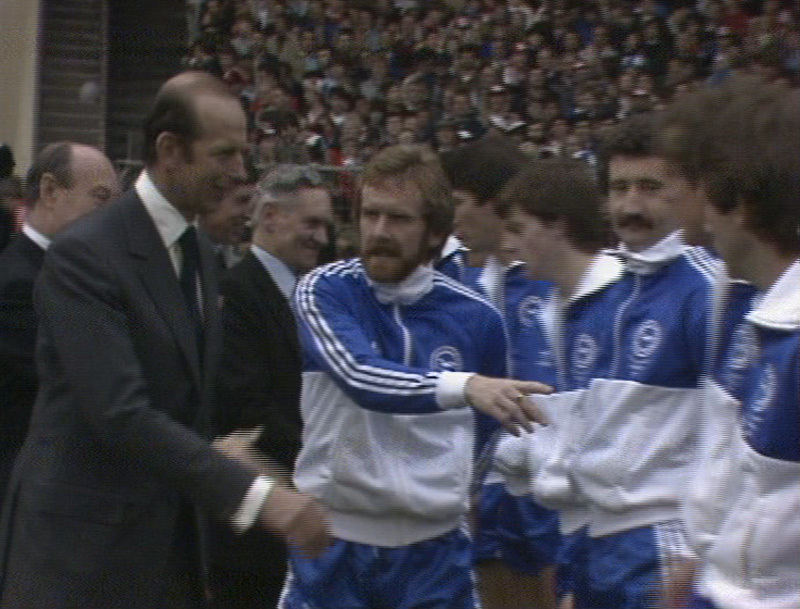 The return fixture against the Reds in March 1982 was the high noon of Bailey’s spell as Brighton manager. A backs to the wall display led to a famous 1-0 win at Anfield against the European Cup holders, with Andy Ritchie getting the decisive goal and Ian Rush’s goalbound shot getting stuck in the mud! The club stood eighth but the wheels came off thereafter with ten defeats in the last fourteen matches. With the club safe from relegation, Bailey had been persuaded by supporters at a fans forum to get the team playing a more open, attacking game. And with that, the genie was out. The team was never the same solid, defensive force under Bailey’s reign, in this or the following campaign, and were never again lording it in the top half of the top division. If Bailey had stuck to his guns, and not listened to the fans, would the club have enjoyed a UEFA Cup place at the end of 1981/82? 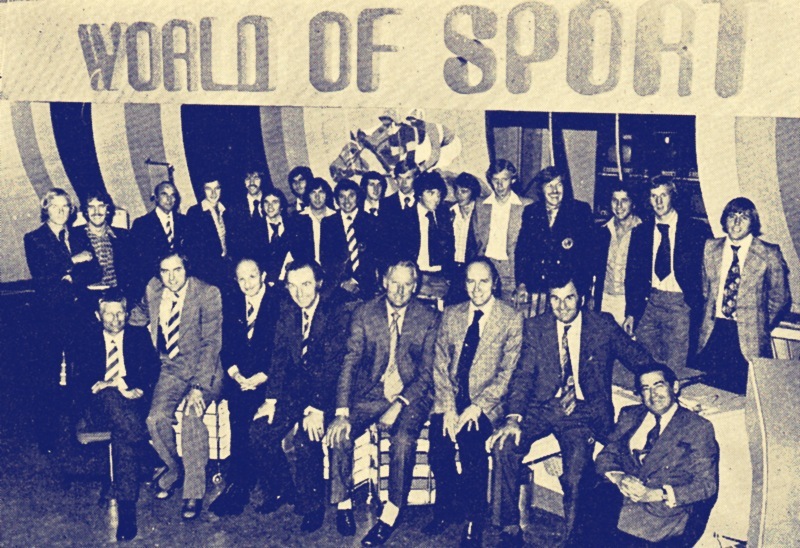 The Albion team of 1975/76 lined-up for a different sort of team picture when they had a break from training and went behind the scenes at the World of Sport studio at London Weekend Television. ‘World of Sport’ was ITV’s answer to Grandstand, BBC’s flagship sports programme on Saturday afternoons. WoS ran from 1965 to 1985. The visit was arranged by Eric Flackfield, a director of LWT who was a frequent visitor to Goldstone matches. He is seated on the right. At the studios on London’s South Bank, the party met Brian Moore, host and presenter on ITV’s On The Ball (which later evolved into ‘Saint and Greavsie) and London Weekend’s The Big Match. Back row (left to right): Phil Beal, Peter O’Sullivan, Glen Wilson (physiotherapist), Steve Piper, Barry Butlin, Tony Towner, Dennis Burnett, Ken Tiler, Ken Gutteridge (coach), Gerry Fell, Peter Grummitt, Joe Kinnear, Ian Mellor, Harry Wilson, Fred Binney, Andy Rollings, Robin Madden, Ernie Machin. Front row: Brian Daykin (assistant manager), Dudley Sizen (director), Harry Bloom (vice-chairman), Mike Bamber (chairman), Peter Taylor (manager), Brian Moore, Tom Appleby (director), Eric Flackfield.